At Soho Theatre for just under a fortnight, theatre company The Wrong Crowd in ‘Kite‘, a new play without words, but with just about every thing else – original music, dance, puppetry and, of course, kites. Part of the 2016 London International Festival of Mime, the show premieres at the Soho Theatre Upstairs until 6th February ( for tour venues and dates see below ). 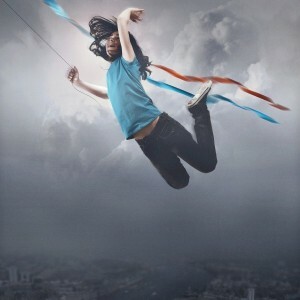 ‘Kite‘ has already attracted praise ( a five-star review in The Stage – ‘enchanting‘ ) and it’s easy to see why. This story is of a newly bereaved young girl, in pain, helpless and bewildered by her own anger and grief at the loss of her mother. She moves, perforce, to live with her grand-mother in London, a woman whose life has the practicality and pragmatism of accumulated years, but who is also knocked sideways by her daughter’s death. These characters and their predicament are poignantly drawn by Charlotte Croft and Liz Crowther. The abruptness and flailing movement of the former captures the teenage girl’s unthinking, incohate rage at being abandoned. This contrasts with the repetitious and patient, light movement of the latter, who summons up her dead child in childhood, through memory. Without wishing to spoil the story, it is fair to say that both are transformed by an adventure with a kite and the piece ends with them beginning to grieve and heal. Programme notes state that the company ‘love[s] to tell powerful, moving, emotionally articulate stories’. This, ‘Kite‘ does, admirably well and on a budget which is miniscule in comparison with the large productions elsewhere in the West End. By their special effects shall you know them and the special effects here are powered by the very best form of image generation – the imagination. The small performance space of the Soho Theatre Upstairs becomes a sea-side home, a train, a tube-train, a London flat, the rain-soaked, wind-whipped London streets and the air above them, with no more than a few versatile pieces of stage furniture, good lighting and music and some props. Yet, in the very best way, the production team and its efforts are entirely invisible. And here I must declare an interest. 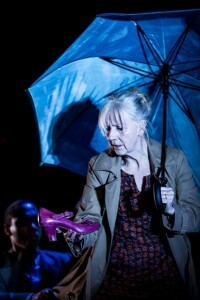 Susan Burns, Stage Manager, is a friend, but this doesn’t influence this review in any way. The sound-scape of London is used, the chimes of Big Ben, the ringing bells of St Paul’s, the underground’s ‘Mind the Gap’ as well as music, especially written for the piece – the notes credit Isobel Waller-Bridge as the composer. Two actors play the winds and the kite ( and if you want to know how that works – and it does, really well – you will have to go and see the production ).When I attended, audience members were held, rapt, entirely engaged by the scenes being played out before them so eloquently but without speech. 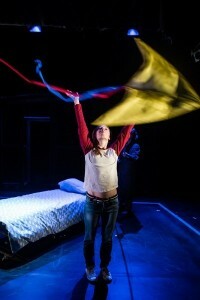 ‘Kite‘ will be on tour across England and Wales until the 9th April. Find out where here. This entry was posted in Uncategorised and tagged London by juliej. Bookmark the permalink.